This week is the Diocesan Grandparent Week. To celebrate this, we invite all grandparents to come for tea, coffee and cake on Friday 3rd October at 2.30 in the school hall. Your grandchild will come and sit with you and then give you a guided tour around the school, finishing at 3.15. Our Y6 children wrote ‘spine’ prayers for the elderly people of the parish and these were distributed during Sunday Mass. All Grandparents (or similar) are warmly welcomed to join us. We have signed up to School Angel. This is a charity that allows the school to make money from online shopping. All we have to do is click on the link below and add to your favourites. On the School Angel page (scroll to the bottom) you will see a selection of shops. Once you click on the shop logo, you will go straight through to the usual homepage of the shop and any spending you do will register a proportion sent to our charity page. It doesn’t cost you any extra but gives us cash! You will be able to see the amount in our funds each time you visit the page. Please click on the link School Angel. Spread the word to friends and family! As mentioned in the information meeting, I am offering drop in sessions for any parent who has an idea to share, a concern to explore or help to offer. This will be on the third Thursday of each month (except where I was double booked!). No appointments necessary. We will review to see if more are needed on an ‘as and when’ basis. 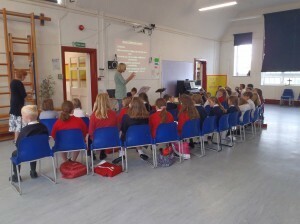 Arundel C of E Primary School’s choir joined forces with St. Philip’s choir in a practise session this week at St. Philip’s. The two choirs are combining in preparation for singing at the Mayor’s Service in Arundel Cathedral on Sunday 28th September. There will be another practise session held at Arundel Primary on Monday afternoon. It is a great way to unite the two town schools in a community event. Thank you to all those who came to mass on Sunday to witness my induction by Bishop Kieran into my new role as headteacher of a catholic school. I felt very supported and feel it was a real community event. 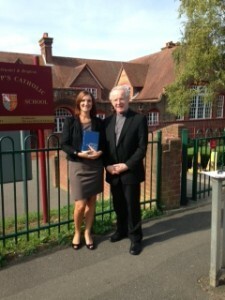 Thank you also to Canon Tim and his team for organising the mass. There will be the annual Animal Blessing Service at the Cathedral on Saturday October 4th at 2.30pm. All pets are welcome. Donations welcome and the proceeds to be sent to Safe Haven Donkeys in the Holy Land to help care for injured and abandoned donkeys in Israel and Palestine. Arundel Under 11s Arundel cricket team played a round of matches during the last week of the Summer holidays and came out as the champions of the Tournament. 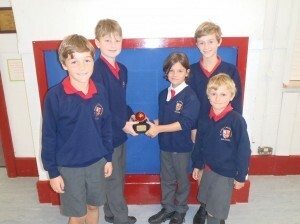 Players from a number of schools, including, Fletcher, Isaac, Jago and Nathan from St. Philip’s played together as a team to win the 2014 trophy. Past pupils, Anna and Charlie, also played. Alex, who is too young at the moment, was the team mascot. Well done to all! We are hoping that when the cricket season starts again next year, we can have some coaching sessions from Arundel Cricket Club during curriculum time. 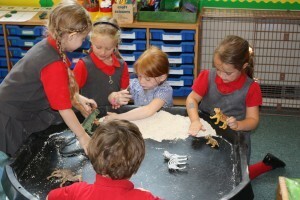 Reception Class have enjoyed their first two mornings in school this week. Big smiles as they arrive and lots of fun and laughter during their time in class with Mrs Tipping. Next week they will stay for lunch after spending the morning in school. All parents, pupils, staff and governors are warmly encouraged to come and celebrate the induction of Mrs Lucy Horne as headteacher of St. Philip’s Catholic Primary School. The mass will be celebrated by Bishop Kieran on Sunday 14th September at Arundel Cathedral at 9.30am. Many congratulations to members of the school choir who sang for the first time at the Arundel Festival. They performed on the Jubilee Gardens stage to a large, appreciative audience, alongside members from the two other schools where Mrs Robinson teaches. The weather was perfect and the children performed 13 songs from memory. We hope to repeat this again next year.